My goodness–how the weeks fly by! And now I’m so behind with my updates to you on my projects and goings-on. So let’s get to it. For one, I hope my sister appreciates the title of today’s post. (It’s an inside joke/obscure ’90s movie reference.) Now that we’ve got that out of the way…let me show you the project I just finished today: my gallery wall! 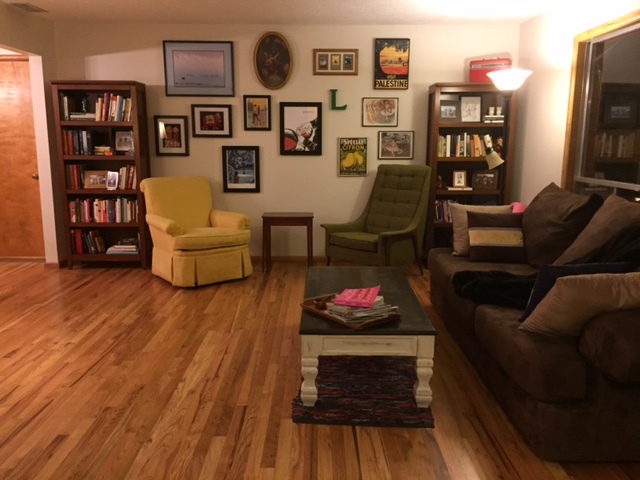 Here is how my living room was arranged before, and you can see my draft of the gallery wall on the floor. Many thanks to my friend Carrie for helping me edit the art and arrange it artfully too. And here is my beautiful new gallery wall! I’m really happy with how it turned out. I did end up cutting two pieces that had been in my final draft–one large piece will go better in my “kid” guest bedroom, and I realized the ceramic plate had a wonky hanger, so it would have looked all lop-sided. Otherwise, I love it!! At first I was reluctant to turn the back of the couch against my large picture window. But I think moving the chairs created a more cozy sitting space. And the couch now looks toward the fireplace, which will be nice in the winter time (assuming I both learn how to build a wood fire and get the courage to actually do it…). I think I feel about my art the way others feel toward their books. I mean, don’t get me wrong, I do have an emotional attachment to some of my volumes. But since I’ve been utilizing the library and borrowing books from friends more and more, my library isn’t really growing much these days. My sister actually bought me the print closest to my yellow chair when we went to Ireland together in 2008. It’s of Lucy discovering the lamppost when she first walks through the wardrobe into Narnia. I absolutely love my newest piece: “Process,” which is of a person pitting pie cherries. “Process” has become a word I frequently use, and an activity I frequently engage in as I reflect not only on my life but on the stories of others’ lives that I encounter every day. What does it mean to “process?” To take something in, to work with it, to respond to it, to be touched by it, to transform it into something greater… I don’t know–those are some things that come to mind when I thinking of processing–be it either in the form of picking fruit or listening to someone’s life story. I suppose the two aren’t all that different–that’s life after all, isn’t it? Full of sour juices and pits, but also the making of something sweet and delicious. My vintage Palestine travel poster is from when my husband and I travelled to the Middle East. I love that old style of travel marketing and propaganda posters. Actually I recall there being a rather large exhibit of vintage travel posters in the Ben-Gurion airport that we viewed when we were leaving Israel. They were shocking in some ways as they described the new state of Israel–the reclaimed promised land for the Jews–“a land without a people for a people without a land…” Don’t get me wrong, I support the existence of Israel, but as someone who has one generation separating me from my full-blooded Indian grandfather, I have a hard time with people who move into a land and claim it for themselves when there are people living there and who have been there for generations. Ok, enough politics for now. Below that are two prints from a larger collection of Degas’ ballerina series that I got at a church rummage sale. I always wanted to be a ballerina, and so of course I love Degas’ work with the dancers. These used to be in my bedroom, which is painted light pink and is very feminine. I considered placing them there again, as I still don’t have anything on the walls in there either, but I’m glad that I included them here. The “Special Citron” fruit label painting is another great yard sale find. I love all things lemon, and I think the yellow color balances nicely with the other various tones on the wall. Hmm, what else is there–oh, up above there is the oval piece that is a vintage portrait of an Indian girl shooting her bow. My mom has a big collection of these type of posters–a fairly pale girl who is supposed to be an Indian, usually wearing a red dress and positioned in some heroic but romantic scene. Next to that is a little collection of retro wooden postcards from the Olympics at home. I think I need a bigger piece to fill out that space better, but it’ll do for now. 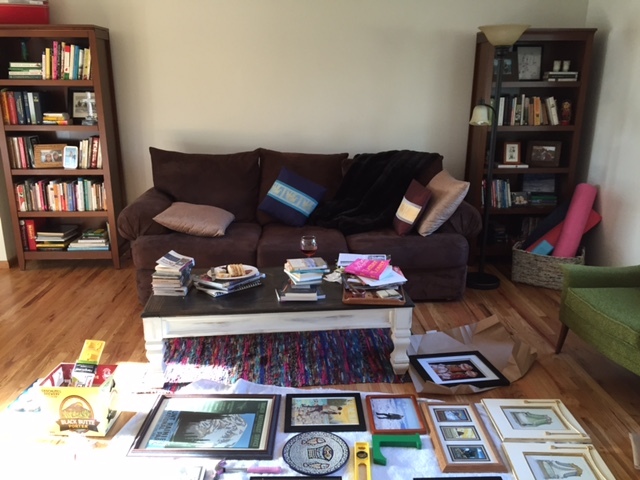 Well there you go, there is some of my little art collection–pieces found along the journey, either at yard sales with my mom or in exotic lands. I didn’t realize until the past couple years how important art is to me. Currently I’m working through a sort of “life transformation” book called The Artist’s Way by Julia Cameron. So essentially I’m trying to embrace my little inner artist–taking time to create beauty and also appreciate beauty in my life. Actually, that makes me realize that that’s probably why I haven’t posted much in the past month–I’ve been journaling and writing an awful lot in response to the assignments in that book. And oddly, having just arranged my gallery wall that is full of other artists’ works, I feel as though I have created a work of art as well.